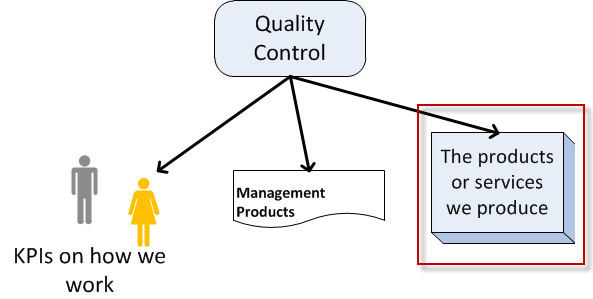 Quality and quality management is interdependent with all the processes, activities, people and organisations involved in a project or programme. Quality management starts from the minute you sell in the idea of a new change initiative. When you pro-actively manage the process of implementing quality the change initiative has a greater chance of success and therefor making your business more sustainable. If quality management is left until later in the process then the team will constantly be playing catch-up. Let us have a look at quality management from two perspectives. To consistently deliver the right capability from projects then achieve the outcomes and realize the benefits in the programme you need to have people with the right talents, backed up by the appropriate processes. For convenience the quality of processes and people will be treated as a programme level topic as it will affect multiple projects. This area of programme and portfolio management has no simple quick fixes; to develop or acquire the right talent takes time and investment. The PMI has done research on talent management that shows a business case for investing in talent management. Many projects will fail because the project manager is not allocated the people with the right talents and skill set to do specific jobs. To address this aspect of quality management you need to have a quality assurance process that pro-actively ensures the people selected for a programme or project have the underlying talent and skill set to work within the context of the programme and project. Use the following guide line/principles to determine if your processes are of the right quality. If the people on the team use the processes and every process adds value to achieving an objective, then the quality of your processes is good. If a process is mandated but people continuously have to use a work around then the quality of the process is poor in the context of that specific project and should either be scraped or refactored. At the programme level it is useful to create processes with guidelines that will enable all projects of a similar type to be delivered successfully. At the project level we need to tailor each project to accommodate the available talent/skill set and other influencing factors specific to the project. To ensure the quality of the processes we use the same principles used at programme level. Use the following check list to determine early warning indicators and key performance indicators to measure quality. This same checklist can be used for risk management as well. Management products are those artifacts that the project team uses to support the build of the project product, such as requirements documentation, project schedules, change request forms, risk registers etc. These products are of the right quality if they fulfill the need that they are designed to achieve. •	The quality criteria by which they will be assessed documented. •	The quality methods that will be used to assess the quality criteria. •	The responsibilities of those who will carry out the quality tests. From the product descriptions US&AT’s will be created as the requirements for building up the products. The Acceptance Tests will be the client’s description as to how they will test the User Scenario and accept it as having been created to the client’s satisfaction. In the Project Product Description, User Scenarios and Acceptance Tests and Statement of Work (SoW) we must define the acceptance criteria for different aspects of the project so that we know when we are done. Delivering the right quality project outputs (products) is dependent on having management products of the right quality and rigor. As with everything else in programme and project management the quality process starts from the minute you start to sell in the idea of a new change initiative. The quality plan needs to focus on process and defect prevention activities. 1. What activities will we carry out to ensure the right level of quality? 2. How will we communicate to stakeholders that we are performing the quality assurance tasks? Carry out reviews on the product description to ensure they represent what the client wants and that the provider can deliver according to the Product Description within tolerances. Run quality reviews at regular intervals during the development build stage, for software development I recommend that you do this at least once in each sprint. Unit tests will enable new features and code maintenance to be done and confirm that previously built functionality has not been broken by the new features. Unit tests act as both a control and a prevention method. By specifically including activities such as Acceptance Testing and performance testing in the WBS, we have a means of assuring quality activities are included in the schedule. Ensure that team members have a realistic work schedule to avoid overloading and the resulting tiredness due to working extra hours. Staff must be able to pay attention to detail, if they are to produce quality work.